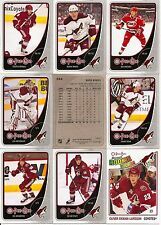 You are purchasing a complete team set of Phoenix Coyotes from the 2010-11 OPC O-Pee-Chee Hockey set. This team set also includes the Team Leaders insert card. Team Leaders. The 19 cards in this team set include. The specific cert number for the item listed can be found in the item title. 2010-11 SP Authentic (1-250) "-Your Choice GOTBASEBALLCARDS"
2010-11 Upper Deck OPC Rainbow Foil Parallels #1-600 - You pick!